Integrated System Europe (ISE), the biggest and most successful AV trade show, returns to Amsterdam this week (Feb. 5-8) with a record-breaking 80,000 AV professionals—from manufacturers to end users and everything in between—descending on the Dutch capital. Now in its 16th installment, 15 of which have been at the RAI, demand for the show—both exhibiting and visiting—continues to grow at a privileged pace. Making its penultimate appearance at Amsterdam’s RAI before heading to Barcelona in 2021, the four-day show will be home to more than 1,300 exhibitors—up on 1,296 in 2018, and from 120 when it first debuted in Geneva in 2004. Of the 81,000 visitors in 2018 (20,000 of whom were exhibitor personnel), 20,000 were attending for the first time, while more than 10,000 were end users—all figures are expected to rise again for the 2019 edition. But size is simply circumstantial of the value the show creates—something Blackman and his team work hard to ensure ISE remains a pivotal event, leaving a meaningful and lasting impression on all those that attend. It’s not just AV professionals in Europe making the trip. “Last year I met a lot of U.S.-based integrators at the show and asked them what they’re doing here,” Blackman continued. “They explained that because business is moving so fast, they need to be at InfoComm in June and at ISE in February to keep themselves ahead of the market. Visiting exhibitor stands, while crucial and hugely beneficial, is of course not the only role of ISE or a dominant factor in what brings visitors to the show. ISE (for those new to the show) provides significant opportunities for AV professionals to expand their own knowledge and indeed their imagination about how AV solutions can be deployed and the benefits they can provide. As is standard for a trade show, this is typically provided through the manufacturers directly, or (for a more independent view) from organized events from ISE itself. “The exhibition is like a magazine in that it has two parts: there is editorial content and there is advertising,” explained Blackman. “For us, the exhibitors are the advertisers. They create content and provide information within that, but obviously most of that is biased toward their own products and solutions. Throughout the week, ISE has organized a host of full-day and half-day conferences designed to appeal and to “inspire” attendees, enabling them to learn from the experts and bring back ideas that can be applied into their own business. These conferences are aimed at addressing developments in fast-moving sectors, Blackman explained. Examples include the Smart Building Conference (Feb. 4), XR Summit (AR, VR, and mixed reality, Feb. 5), Digital Signage Summit (Feb. 5), and the Digital Cinema Summit (Feb. 6). Conferences this year will be hosted both in and outside of the RAI, with the nearby (seven-minute walk, by our watch) Hotel Okura, playing host and providing an extension to the RAI. A shuttle bus is available for those who require it (or those who are feeling lazy). 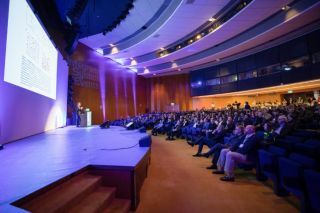 Space, as often debated when discussing ISE, has been in short supply as a result of the show’s growth in recent years, forcing the organization’s hand in making a move to a larger venue: the Gran Via in Barcelona in 2021. However, the RAI has grown since the 2018 edition, with Hall 5 being extended, increasing its capacity by 30 percent. Blackman noted in a previous interview how ISE has been forced to turn down new exhibitors because of a lack of space and occasionally inform current exhibitors that room was no longer available due to other exhibitors taking up the option of increasing the size of their own stands. However, the expansion of Hall 5, which will be a temporary fix for 2019 and a permanent one for 2020, has ensured all those on the waiting list will be present at the show. He continued, “Another thing we’ve done to make the ISE experience more comfortable is including the Okura Hotel, which has allowed us to extend the conference program. We have been getting increasing demand from our exhibitors to bring more vertical markets to the show, so we’ve created some additional conference facilities over at the Okura. Every day we’ll be running half-day conferences there, two of which will be making their debut at the show: the Digital Cinema Summit and the Hospitality Technology Next Generation. The growth will continue as exhibitor numbers are expected to rise in 2020, while visitor numbers tip closer to 90,000. Blackman and his team have been working hard to encourage people to stay for the duration of the show rather than just a few days. He notes that the show is at its busiest on the opening Tuesday and Wednesday, with Thursday and Friday typically quieter as many people head home. This tendency is due to many of the headline aspects of the show, such as main keynotes, conferences, training, and launches being crammed in at the beginning. This year, however, the show is taking a staggered approach, with events taking place all week. There will be a closing keynote on Friday afternoon to encourage a longer stay. The change, he says, will make for a far more pleasant and informative experience for many. Blackman revealed that ISE is exploring opportunities to help improve the experience (and safety) of getting around the RAI, which can be confusing for visitors. This year, improvements have been made to the official ISE app in helping people find where they need to go, while some areas have been made one-way to avoid bottlenecking and subsequent overcrowding. While offering knowledge, insight, training, and the like are all key to making ISE a destination for the industry, Blackman insists its appeal extends far beyond the walls of the RAI.